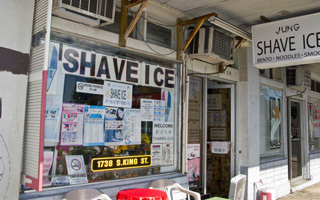 Shave Ice store on 1738 S. King, down the street from Baskin Robbins. 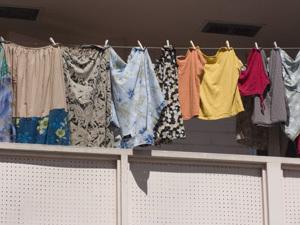 Clothesline on Young Street a few doors down from Punahou Circle. 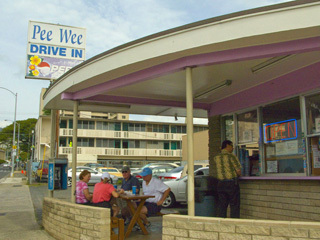 Pee Wee Drive In--a Lower Makiki landmark, Punahou/S.King St.
Before he ever resided in a stately Hyde Park mansion or breathed the rarified air of the White House, Barack Obama grew up in the unassuming Honolulu neighborhood of Makiki. Located in the urban heart of Honolulu, it's bounded by downtown skyscrapers to the west and rainy Manoa Valley to the east. Makiki is only two miles, but world's apart, from the glamorous beach at Waikiki. A cluttered mix of modest bungalows, 1960's cinderblock walkup apartments and churches of every stripe, the neighborhood neatly encapsulated young Barack Obama's life. Within a five block radius of his grandparent's two bedroom apartment was his birthplace (Kapiolani Hospital), his school (Punahou), and the playgrounds where he refined his jump shot. Long a transient neighborhood, Makiki was host to second or third generation immigrants moving up the social ladder en route to classier digs in East Honolulu. Obama's neighbors, said Honolulu historian and archivist DeSoto Brown in a Wall Street Journal article, "were mostly store clerks, restaurant workers and small business owners--many aspiring to government jobs." Walk down the street from the Punahou Circle Apartment complex where Obama largely spent his high school years, and you'll see a plethora of small business--a beauty shop, a karaoke lounge, a shave ice store, a nail salon and the Baskin-Robbins ice cream store on 1618 South King St where "Barry" (as he was known in those days) found employment. Makiki's funky grit was captured recently in an AP photograph where Obama attempted a walk while visiting the apartment of his dying grandmother. (This was the very same 10th floor unit where he'd previously lived.) His walk was curtailed by the throngs of onlookers who gathered nearby to catch a glimpse of the future president. Although the demographics of Makiki are humble--mainly working class Japanese, Chinese, Korean, Filipino and Micronesians--powerful institutions are stationed nearby. 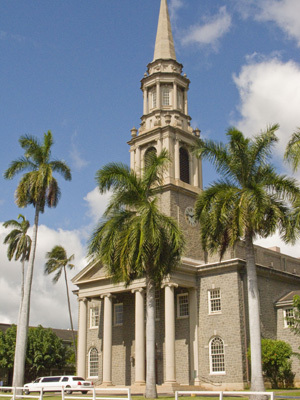 Central Union Church, a massive edifice whose parishioners include many of Hawaii's elite, stands directly across the street from Barry Obama's old apartment. A ten minute walk away is the 76 acre Punahou campus the fabled prep school that Obama attended between 1971 and 1979. Long time residents say the neighborhood hasn't changed much in the thirty years since he attended high school. A few new apartment buildings and condos have replaced some of the shops and tiny clapboard cottages but a stroll down Puanhou Street, from his grandmother's apartmentPunahou Circle to campus, reveals that most of the old icons--Kapiolani Hospital, Shriners Hospital and other landmarks are still there. Likewise, the profusion of telephone lines, which would be buried in a more affluent neighborhood, still hover above the sidewalks and clotheslines still bedeck the balconies of aging two story walkup apartments. Ever a stewpot of races and ethnicities, Obama's humble Makiki upbringing played a central role in his Hawaii experience. Parking your car: During the weekdays parking may be challenge. It's tempting but don't park in the Central Union Church lot. On the weekends there should be plenty of street parking. 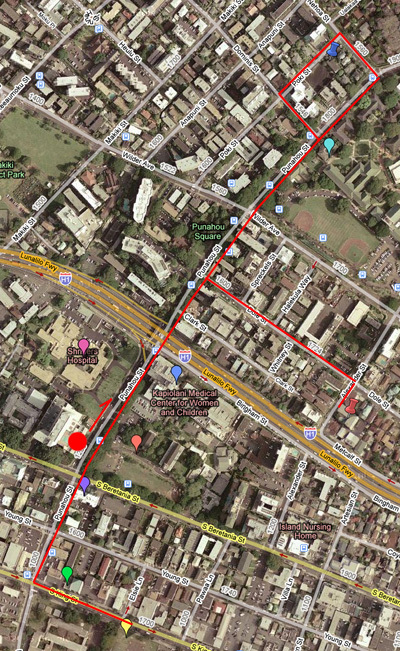 Find your way to the corner of Punahou and Beretania Streets. Cross Beretania, over to the Central Union Church parking lot , to get a good photo of Punahou Circle Apartments the longest term residence of Barack Obama in Hawaii. Continue walking up Punahou (towards the mountain) and you'll be in the footsteps of Barry's school route. The first major landmark is the Shriner's Hospital on your left. Walk one more block down Punahou and on your right is the Kapiolani Medical Center for Women and Children . Obama was born there on August 4, 1961. Continue another two blocks and you'll run into the Punahou School campus of on the corner of Punahou and Wilder, This is where Obama attended from 1971 (5th grade) to 1979 (12th grade). Do not go through the campus gate! (The security people will not be amused). If you do want to see what campus looks like go to the Punahou Days section of this website. Continue up Punahou one more block and take a left on Dominis Street. Walk one block and take a right on Poki Street. On the end of the block, on the right hand side, you'll see 1839 Poki Street , where Obama's mother lived with Barry's sister, Maya. Presumably, Obama, who lived a few blocks away with his grandparents, would often visit. Backtrack to Punahou Street past Wilder one block and turn left on Dole Street. Walk two blocks to Alexander Street and take a right. Just around the corner is 1427 Alexander Street where the elder Dunhams (Barry's grandparents) lived in 1963. Presumably young Barry visited his grandparents at this site as well. Retrace your steps and head down Punahou, towards the ocean to the corner of Punahou and Beretania. (Note that Punahou is the only nearby street that allow you to traverse the freeway.) This part of lower Makiki is a sort of epicenter for any number of churches. In addition to Central Union Church , which looms across the street from Punahou Circle, you'll see the First Church of Christ, Scientist (1508 Punahou St.) which is just up the street on Barry's old route to school. 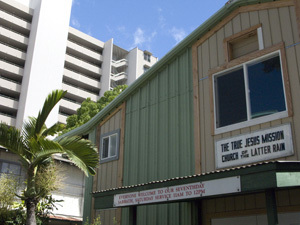 Next door to the Punahou Circle Apartments (on your left facing the Beretania entrance) is the Shinshu Kyokai Buddhist Temple (1631 S Beretania St.) and down a block is the Olivet Baptist Church (1775 S Beretania St). 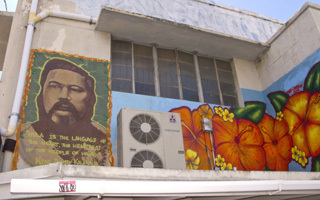 The other next door neighbor to Punahou Circle Apartments, on Punahou Street, is the True Jesus Mission of the Latter Rain, which stands literally in the shadow of Obama's former home. Cross Punahou Street (stay on Beretania) heading one half block East you'll find The Church of Jesus Christ of Latter-Day Saints (1560 S Beretania St). Finally you'll not want to miss the Full Gospel Church (whose adherents are almost entirely Korean) on 1541 Young St, just around the corner from Barry's old apartment. Continue your walking tour from the Punahou Circle Apartments by walking down Punahou Street heading south towards the ocean. You'll pass the True Jesus Mission of the Latter Rain and then Young Street. The next block is King. Take a left on King and just around the corner you'll see the Baskin-Robbins ice cream parlor where Barry worked in high school. Across the Street is Washington Middle School , where he first learned to play basketball. Head back towards Punahou Street and at the Intersection of King and Punahou you'll see a Checkers Auto Parts - a garish pink building that was once a movie theater. It's a safe bet Barry Obama saw Star Wars and undoubtedly many other films here as it was the neighborhood theater. If you've worked up an appetite there are a number of excellent, inexpensive cafes nearby. Central Union Church has had a close relationship with Punahou School for generations and it's traditional that students participate in a baccalaureate a week before graduation. The church has a very established congregation which includes many Punahou students' families as members. The church traces its roots back to 1833 with the establishment of the Seamen's Bethel in the Port of Honolulu. The church moved on several occasions after that and in 1922, the cornerstone was laid at the current site at Punahou and Beretania streets. The structure was completed in 1924. 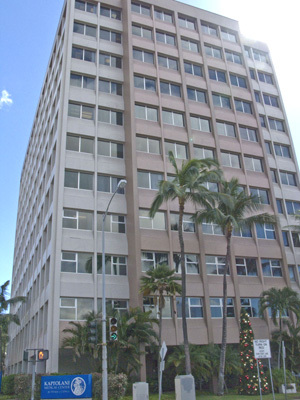 Kapi'olani Medical Center for Women & Children is the site of Barack Obama's birth on August 4, 1961. Located in the Makiki district, it was originally established by Queen Kapi'olani as the Kapi'olani Maternity Home in 1890. Today it is part of Hawaii Pacific Health's network of hospitals. s the state's only 24-hour pediatric emergency room, pediatric intensive care unit and adolescent unit. 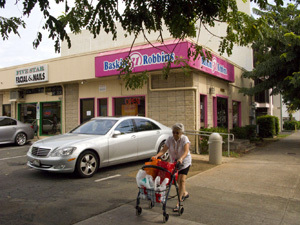 Baskin-Robbins, an ice cream store located 1618 S. King Street, was one of Obama's first jobs. It's only a few minutes walk from his grandparent's apartment on Beretania Street. 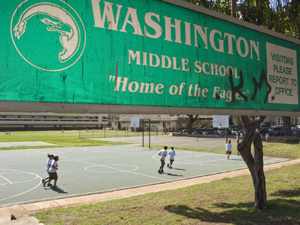 Washington Middle School Playground, located on 1633 S. King Street, is only a few blocks from Obama's 1617 Beretania Street residence and was where Obama first learned to play basketball.